estate sale find, originally uploaded by ordinarymoment. 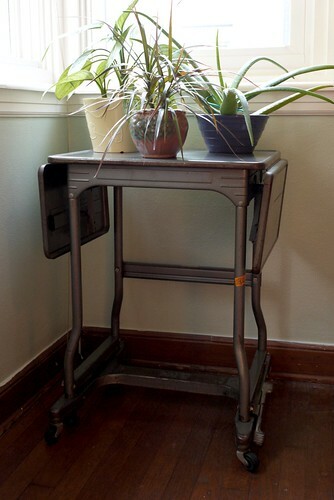 Some more vintage love–a 1940s-50s metal typewriter cart found at an estate sale this weekend…for 5 bucks. What a deal! Discouraged by the lack of treasures elsewhere, we come across a sign for a sale. We go. We find! Isn’t that the best? Recycling at its finest. Taking old, forgotten things and giving them new life. The quality, the character, the story. This is why we hunt for vintage gold whenever we can. I also found a Gwen Frostic print book and a tiny framed cardinal print to brighten up our winter time. Happiness in the things of old.